Frequently performs solo recitals in both Asia and America. 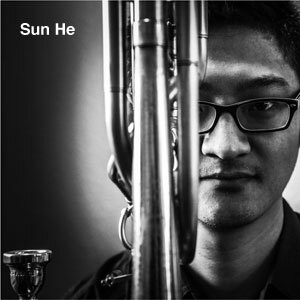 Sun He is a trombonist/bass trombonist, originally from Beijing, China. As a performer, Mr. Sun has played with numerous ensembles around the world, include China National Symphony Orchestra, Hang Zhou Philharmonic, Guangzhou Symphony, Oak Park Symphony, the North Shore Chamber Orchestra, Logos Symphony, Lakefront Low Brass Quartet, and many others. He toured Asia with Lakefront Low Brass Quartet in 2012, and presented a series of Master Classes. Mr. Sun also held the bass trombone position with the Pennsylvania Philharmonic. He frequently performs solo recitals in both Asia and America, and regularly gives first performances of new music by living composers. He also has multiple commissioned solo works that are composed especially for him. As a brass instrument instructor, he operates a private teaching studio. He also served as a faculty member at the first annual Wrobleski International Low Brass Seminar in August 2015 in Beijing, China. He graduated from Roosevelt University, Chicago College of Performing Arts and Temple University, and his most influential teachers include Jay Friedman, Charlie Vernon, Blair Bollinger, Nitzan Haroz, Matthew Vaughn, Micky Wroblseki and Reed Capshaw.